One year after she nearly died on a flaming jetliner at O’Hare, Kathy McLoyd says she still fears something will happen. Kathy and her husband Peter were sitting in row 29 of American Airlines flight 383 last October 28, bound for Miami, when the right engine exploded on takeoff. With the right side of the aircraft engulfed in flames, the captain managed to stop on O’Hare’s runway 28 right, just as the giant jetliner reached takeoff speed. Had the explosion happened just a few seconds later, after the plane lifted off the runway, the results almost certainly would have been catastrophic. Inside the giant Rescue 1 firehouse in the center of the field, firefighters actually saw and heard the engine explode. At that very minute, the firehouse’s red hotline from the control tower began to ring. Controllers declared a “crash alert” and stopped every airplane on the field, giving the O’Hare firefighters the run of the airport. Investigators would later learn that a fan disk inside the engine had flown apart, a catastrophe known as an uncontained engine failure. One piece had flown thru the wing, and ended up crashing though the roof of a cargo facility thousands of feet away. Newly released video obtained by NBC 5 Investigates shows just how close an American Airlines jetliner came to disaster when an engine exploded on takeoff last October. Phil Rogers reports. When that happened, it severed a fuel line. And with the wing loaded with 3,000 gallons of jet fuel, fire was gushing everywhere as the first crews arrived. Inside the aircraft, Peter and Kathy McLoyd were scrambling for the exits with 159 other passengers, as fire roared outside. Just ahead of them, an off-duty pilot managed to open the left over-wing exit. The National Transportation Safety Board says that door was the first to open, just ten seconds after the aircraft came to a stop. 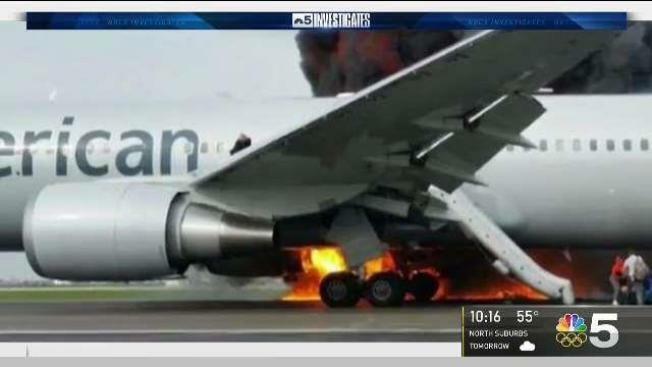 The NTSB has released a lengthy report on a fire on an airplane at Chicago’s O’Hare Airport, and it reveals the frightening details of the case. 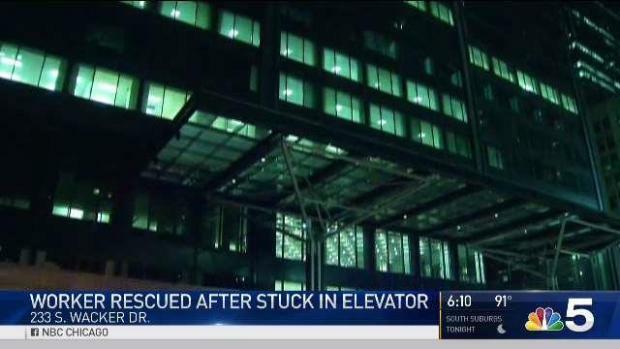 NBC 5 Investigates’ Phil Rogers has the latest on what the report has to say. The McLoyds did escape the aircraft, along with all other passengers and nine crew members. Kathy McLoyd landed in a heap at the bottom and said she couldn’t get up. Her husband slid down just behind her, got her to her feet, and hurried her to edge of the runway as the fire roared behind them. At that point, he collapsed in the grass, doubling over in pain. Somehow, he had managed to lead his wife to safety, running on a broken foot. Official reports say the last person off the plane escaped just 2 minutes and 21 seconds after it stopped rolling. 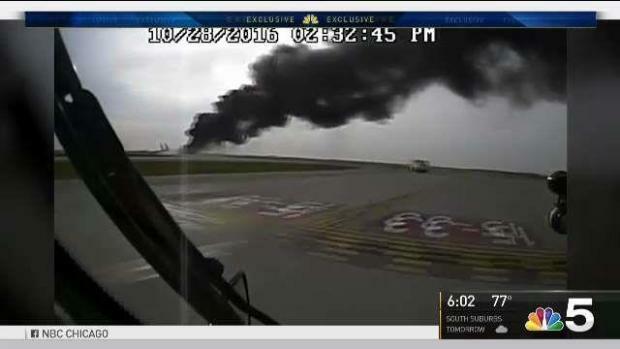 For the O’Hare firefighters on scene, who train for such an event every day, it was their first real aircraft fire. The incident is still under investigation. The engine in question, a General Electric CF6 80C2, is a workhorse for the world’s jet aircraft. Preliminary reports point to cracks radiating from anomalies in the metal of the stage 2 fan disk which failed. That disk is about 2 feet in diameter, but when it flew apart, the shrapnel flew out at enormous speed. Other disks in similar GE engines have suffered failures in the past, but this was the very first explosion involving that stage 2 disk. Investigators grew so concerned, they actually tracked down an aircraft containing the only other disk from the same metal casting as the part which failed in Chicago. But that disk passed inspection. GE spokesman Rick Kennedy says a similar call went out to examine all stage 2 disks in all CF6-80 C2 engines in service during routine maintenance. All appeared normal. A final report on the crash is expected from the NTSB early next year. In the meantime, the McLoyds have moved on. Peter still has trouble with his foot, and receives treatment for PTSD. Both have flown again, but say they find it difficult.